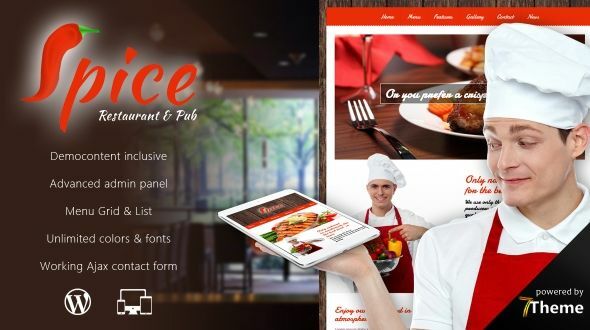 Spice is a beautiful WordPress restaurant theme. You can use it for restaurant, pub, cafe, coffee shop, wineries and other companies offering foods and drinks or you can use it for company profile. This template has 2 build-in post-types for meals and drinks, 3 meal templates (grid, list and simplelist) and 3 drink templates (grid, list and simplelist). Spice was made to be easy to customize to match your branding from within the WordPress admin area. It is also easy to Upload Your Logo. None of this requires editing code. Spice is ready to use from the box. Quickly install it via FTP or WordPress and after you activate it you can load demo content. Then you can add your own content on already designed pages. Spice looks well on all devices like iPhone, iPad or large screen.